Published in Rafu Shimpo, February 26, 1969, Japanese section. 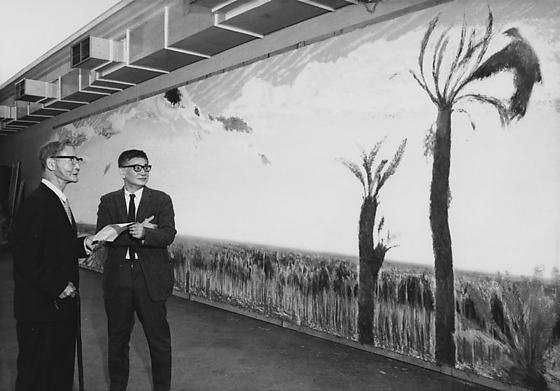 Artist Taro Yashima stands in front of his mural of the ancient dinosaur world for the Kagoshima Science Museum prior to sending it to Japan at the Natural History Museum of Los Angeles in California, February 25, 1969. 1P and 3N: Yashima in suit and eyeglasses stands with arms crossed in front of a mural depicting an open landscape with a dirt path at left and a bird flying near two palm trees at right. 2P and 4N: Yashima stands beside Yukichi Ogawa, an elderly man in suit and eyeglasses holding a cane, who donated dinosaur fossils to the Kagoshima Science Museum. Typed on original negative envelope: Yashima, Taro -- L.A. County Museum.